Pierre Gasly admitted he struggled to see the starting lights go out at the Australian Grand Prix on Sunday. 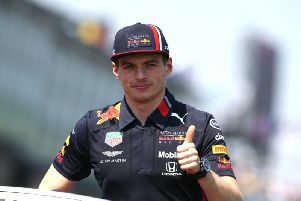 The Frenchman, making his debut for Red Bull Racing, qualified a lowly 17th on grid for the season opener, and with the larger rear wings on the new 2019 cars, seeing the lights proved a problem and he lost a few positions off the start line. With overtaking notoriously difficult in Melbourne, Gasly's charge through the field stalled when he came up to Daniil Kvyat - the man who replaced him at Toro Rosso - in the battle for the final point. In the end, Gasly had to settle for 11th spot, while team-mate Max Verstappen claimed third place behind Mercedes duo Valtteri Bottas and Lewis Hamilton. “It was a pretty difficult race," Gasly said. "With the new bigger rear wings, I couldn’t see the lights on the grid so I had to react with the cars around me and I lost a couple of places. Then I got stuck in traffic and even with the DRS, it’s super difficult to overtake here plus I had some debris in my front wing which didn’t help. "I spent the whole race five tenths from the car in front but my tyres were just sliding and I couldn’t get past. I pushed as much as I could and I tried everything but it wasn’t enough to make it into the points. "In general, the pace over the weekend was really good. In qualifying, we got knocked out of Q1 but I was happy with my first lap and it was just unfortunate that we didn’t make it through." Last season, Gasly made the headlines with a sensational performance to claim fourth place in Bahrain, where the F1 circus travels to next.